Having just attended a workshop where we talked about social bookmarking and tagging, I thought this would be an opportune time to tell you all about a fun project I worked on early last winter! Two fellow students and I had been tasked with proposing a “digital information resource” — yep, pretty broad!!! But our group had a strong interest in teen librarianship, and I was riding high on Andrea Lunsford’s Stanford Study of Writing, New Literacy, Content Creation, blah blah blah, and so we easily decided to propose an interactive, social catalog for teens. 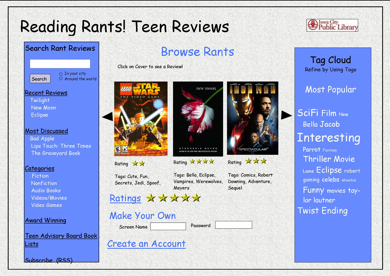 In this paper we explore the possibility of creating and implementing an interactive library OPAC interface, called Reading Rants!, that would be designed for and used exclusively by teens. An interactive interface such as Reading Rants! would allow teenagers to interact with their library catalog by contributing content to bibliographic records. Content creation is an integral aspect of the Web 2.0 experience; it transforms the user’s experience with the catalog into a dynamic conversation. By providing this highly valued service for teenagers, public libraries would elevate their worth to future library supporters and become more essential to and embedded in the community. Finally, I want to add that my co-authors for this paper, Rebecca Ramsey and Rebecca Troup, were fabulous to work with. We were one of those synergistic teams where everyone brings something different to the table: Rebecca R. is an IT whiz, Rebecca T. has extensive visual design experience, and I’m the writer & theorist in residence. Together, we were a pretty rad mix.